I have a really long day ahead.. Driving to AD for work, then to Dubai for a bunch of meetings back to back, and a dance class with the ladies in the evening.. A fun little way to shake it and get some long needed exercise.. (I will dance tonight Rasha sweets - you'll see :) So I felt like a nourishing breakfast and thought of making myself a little oatmeal bowl before I kick-start the day.. 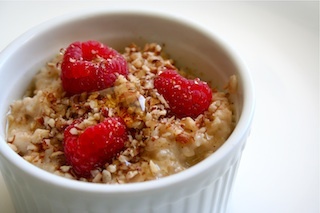 In a saucepan, heat the milk until it comes to a slight boil, then add the oats and cook for a minute or so before adding salt, sugar and cinnamon.. Cook for another minute or two, then take the pan off the heat.. Divide the oatmeal into two bowls or ramekins, place a few raspberries, sprinkle with the crushed pecans and drizzle with a little honey.. Quick, simple and morning yumminess! hello,thanks a lot for the nice recipes :). i want to ask u when you say a cup you mean like a meg or juice cup or what?